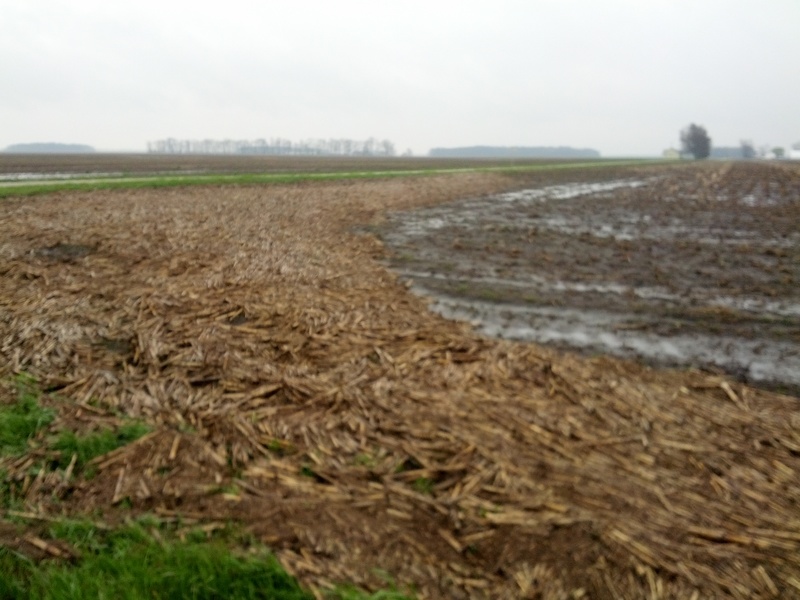 I recently posted this picture of amassed corn stalk residue on my The Farmer’s Life facebook page with the description “Water has caused crop residue to accumulate in some areas creating a thick mat. In our no-till fields. We may have to burn a few of these to assist the planter in placing seed correctly.” The first comment on the photo resulted in the post you are reading right now. That comment read “What’s a no till field? Why would you not till a field?” A great question. There are many kinds of tillage including not tilling at all. Reducing fuel, labor, and equipment costs are the most quantifiable benefits of not doing any tillage. Our current tillage system normally includes a fall chisel plow pass to manage residue followed by a pass, or two, with a field cultivator to prepare a seed bed for planting. This system would be called minimum or conservation tillage by some, but right off the bat a no-till plan cuts at least two trips across our ground out of our budget. If we quit doing tillage over our whole farm we’re looking at removing a couple of gallons per acre of fuel from our expenses. Take the price of diesel today times our just over 2,000 acres of farmland and you’ll get a fairly substantial number. That’s also fewer hours on a tractor meaning more value at trade-in time, and less wear and tear on tillage tools. In fact I believe if we went 100% dedicated no-till we could sell off all our tillage tools and downsize one tractor from our lineup. 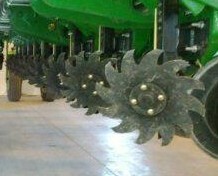 We’ve recently purchased a John Deere 2623VT vertical tillage tool, but let’s keep things simple for now. Improved soil structure is another big benefit. Tillage disrupts the natural structure of soil and releases some of the carbon soil organisms thrive on. Soil biology plays an important role in providing crops with the water and nutrients they need. Potential for erosion can be reduced by leaving more residue on the surface in the months when there are no crops growing. Residue allows for rainwater and snow melt to infiltrate the soil rather than causing surface run off that will carry away topsoil and nutrients. Of course if enough rains falls on already saturated soils you’ll have some runoff no matter what. We are experiencing those conditions right now. Reducing soil compaction is a great benefit. Soil gets compacted any time equipment drives over the surface. The weight of farm equipment compacts the air and water pockets present in soil that allow for the movement of water, crop roots, and soil organisms. Combines and grain carts are the worst offenders because they are very heavy. Since no-till reduces the amount of equipment a field sees the threat of compaction is reduced. Compaction cannot be avoided completely, but it can be managed by limiting field traffic to certain areas. Subsoilers and cover crops can also correct compaction issues. This piece has gotten fairly wide circulation and deservedly so. I have a few quibbles and observations. 1. You really need to disentangle biotech seeds and problems relating to the pesticide use associated with specific seeds before you explain how they are related. To someone who isn’t already on top of the issues, they are hopelessly conflated in this piece. The local differences over glyphosate are feeding the long-running debate over biotech crops, which currently account for roughly 90 percent of the corn, soybeans and sugar beets grown in the United States. This is the opposite problem from what Amy Harmon was criticized for in her citrus greening piece. Many felt that she did not provide enough context. I disagreed with that criticism. I thought Harmon was wise not to attach a giant boilerplate rehash of the entire GMO debate before moving on to tell the story that she had chosen to tell. Balancing the proper amount of background necessary for clarity and context is tricky. 2. Strom’s choice to use the term ‘biotech’ without ever using ‘GMO’ is an interesting and loaded choice. I’m not entirely sure what to make of it. Is there a move a foot at The Times to tell these stories in a less polarizing way? Not enough data. Stay tuned. 3. I’m sure that this story will fuel Monsanto Derangement Syndrome but it’s not clear to me that there are any clear policy takeaways other than the need for funding independent ag research at our public universities to make sure farmers get the information they need to make good choices. An article by Dan Charles for The Salt on Bt resistance in the corn belt actually does a good job of identifying the problem as an issue created by poor crop and pesticide management rather than blaming biotech. The insinuation is the title, but not the reporting. The comment section is a battle of bumperstickers vs. balance. In May, Andrew Kniss asked the world to stop using the term “Superweed” and brought some perspective to the role of biotech in herbicide resistance.